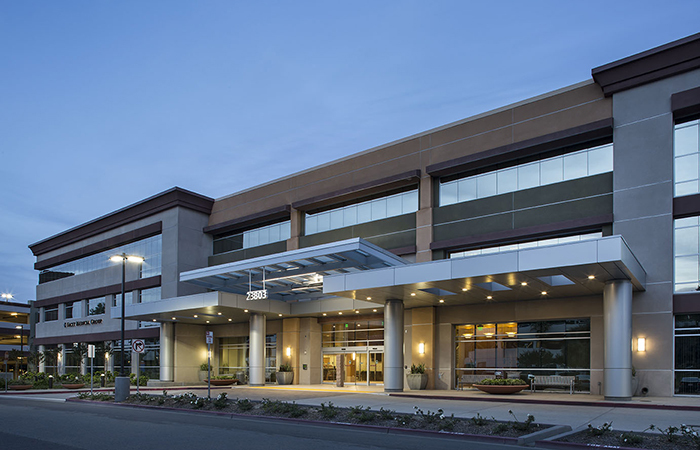 The Henry Mayo Newhall Hospital Campus located in the community of Valencia, has experienced inpatient growth of 8% each year since 2000. SWA Architects is the lead designer, assisting the hospital's senior management with a 25-year master plan. In this process, short and long term goals have been identified. Among the group of projects addressing immediate needs are an expanded Emergency Department, new Laboratory, Pharmacy, Covered Walkway, Radiology, and a Critical Care Unit with the latest technology. Slated long range projects include a new hospital wing, additional parking, Helipad, Medical Office Buildings, and landscaping. Throughout the process, the design focus has been to incorporate community sensitivity, while at the same time establishing a distinctive campus identity. Colors for the most part echo the earthy tones of the surrounding retail and commercial establishments, and the use of sun screens to give a sense of depth and impart a human scale while adding visual interest. The new landscaping will relate to the existing and new buildings integrating screening trees, small flowering accent trees and canopy trees in the parking lots to provide shade.